The nail jewels I got were little M’s. I was actually so touched by it because it felt so personalised to match my name (even though it might’ve just been random :P). Growing up I didn’t really love my name. Michelle was (and probably is) a super common name and I remember always having at least 3 other Michelle’s in every class. I always wanted a different and unique name or something that sounded exotic. In the last few years though I have really come to love my name. The thing I love most about it is that my a) my parents chose it and b) it’s french…..and voila! A french affair on the nails 😉 Ok ok some might consider that a giant leap but it makes total sense to me. Let me show you. I started out with 2 coats of Tip Top – Melting marshmallow. The most gorgeous light pink ever. Once that was completely dry I went to work with the striping tape and taped up all my nails. I then went one nail at a time and used a nice thick coat of Essence – Grey-t to be here. I removed the tape immediately on each nail before moving on to the next one. Once that was done and the tape all removed I left that to dry completely. Once it was dry I decided to really test my freehand skills again. I know I really stink at it – as is evident here – but I need to practice to see if it will help. So I used a black striper and on my pinky and index I drew on the ribbon and ‘bow’. I saw ‘bow’ because I am not sure it looks much like a bow but now that I have told you what it is it totally works right? 😛 Ok well, it’s a ribbon and bow! 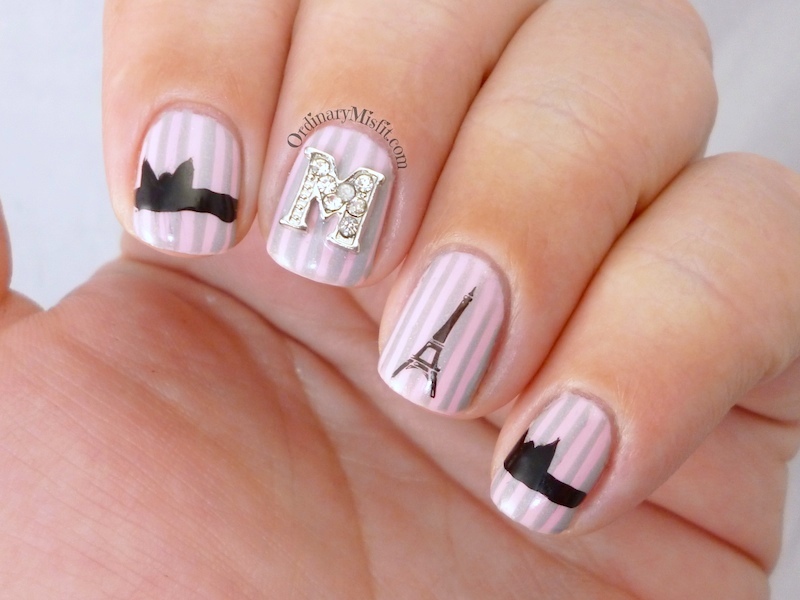 On my ring and thumb I stamped the Eiffel tower using an Essence stamping plate and Essence stampy polish in black. (The image on my ring finger looks a teeny bit like the leaning tower of Pisa but shhhhh) Finally it was time for the final piece and inspiration for it all. I top coated everything and while the topcoat was still wet I placed the Nail Candi ‘M’ on my middle finger. I did not use glue because I knew I wasn’t going to wear this longer than a day. The jewel is the perfect size to fit almost any nail in my opinion. It is also pretty light weight and you can barely feel it on the nail. When I just applied it I was a little worried that it would stick out too much and catch on everything but I didn’t have a problem at all. It does obviously extend above your nail a bit but I didn’t have any snagging or pulling issues. I did run my fingers through my hair once and a few loose hairs wrapped around it but I just kept pulling my hand through my hair in the same direction and it all just ‘flowed’ around it. What I am trying to say, it isn’t something I had to watch or be careful of while wearing. There are a ton of different jewels you can choose from and they are super affordable. Remember they are 00% reusable so you can use them over and over again. Which makes them even cheaper than they already are! This is really pretty 🙂 The nail jewel looks great. Thanks so much Kerry! I love the jewels! So cute! The French theme to match your name is adorable. Thanks so much Lesley. I kinda liked it too. Thanks Faeema. I thought you might appreciate it 😉 PLEASE remind me to chat to you about that stamp.